Trout Point is the only member of Small Luxury Hotels of the World in Canada. Founded in London, England, in 1990, Small Luxury Hotels of the World (SLH) is the world's most prestigious boutique hotel group. Trout Point Lodge is honoured to be part of this exclusive membership. SLH has stringent criteria for becoming a member. Following an invitation to apply, a candidate property forwards its official dossier to the group's regional office in New York. If the application meets a set of formal conditions, suitability is evaluated during an initial property inspection. After these preliminary efforts, the establishment is visited to determine whether its services comply with the stringent SLH standards. These inspection reports are examined by the board of directors which approves the acceptance of new members. Regular anonymous inspections occur thereafter. In addition, Trout Point Lodge is annually inspected and approved by Conde Nast Johansens, the sole international luxury travel guide from the "most trusted name in travel publishing," Conde Nast Pubications. The Lodge is the only hotel in Atlantic Canada recommended by Johansens. Trout Point is also inspected & recommended by AAA/CAA, and inspected biennially by Canada Select, having won a 5 star rating for Inn lodging and 4 and a half stars for Black Bear Cottage. Trout Point is also a member of the BedandBreakfast.com Diamond Collection, an exclusive group of professionally inspected and guest reviewed luxury inns with extensive modern amenities. In 2013, the Lodge became a member of Select Registry after a rigorous inspection process. In its most recent aedition, Frommer's Guide awarded Trout Point Lodge three stars, it's highest rating. "A memorable vacation experience." In January, 2017, Booking.com presented Trout Point Lodge with a 2016 Guest Review Award. Only those who have actually stayed at a property can leave a review on Booking.com, which asks guests to contribute through prompts in follow-up emails and notifications in the app. Guests are given one month to write their review, so their experience is still fresh in their memory. At the beginning of 2017, the Guest Review Awards will be sent to any Booking.com property with an average score of 8 or above, based on reviews published on the site up to 1 November 2016. Only properties with 10 or more reviews are eligible. In 2015, Vacation Idea: Dream Vacation Magazine named Trout Point Lodge among the world's top 25 best secluded romantic getaways. "Trout Point Lodge is a beautiful eco-destination for adventure-lovers and romantics alike." 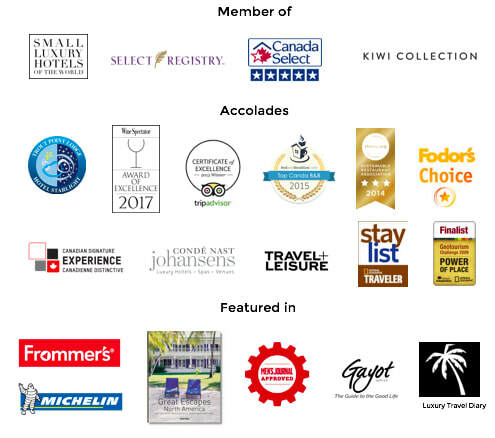 In 2015, the worldwide travel site Booking.com selected Trout Point Lodge for two major honours, placing it on a list of the top 5 most luxurious eco-friendly accommodations in Canada in June. In December, Booking.com named Trout Point among the top 10 unique Canadian accommodations. 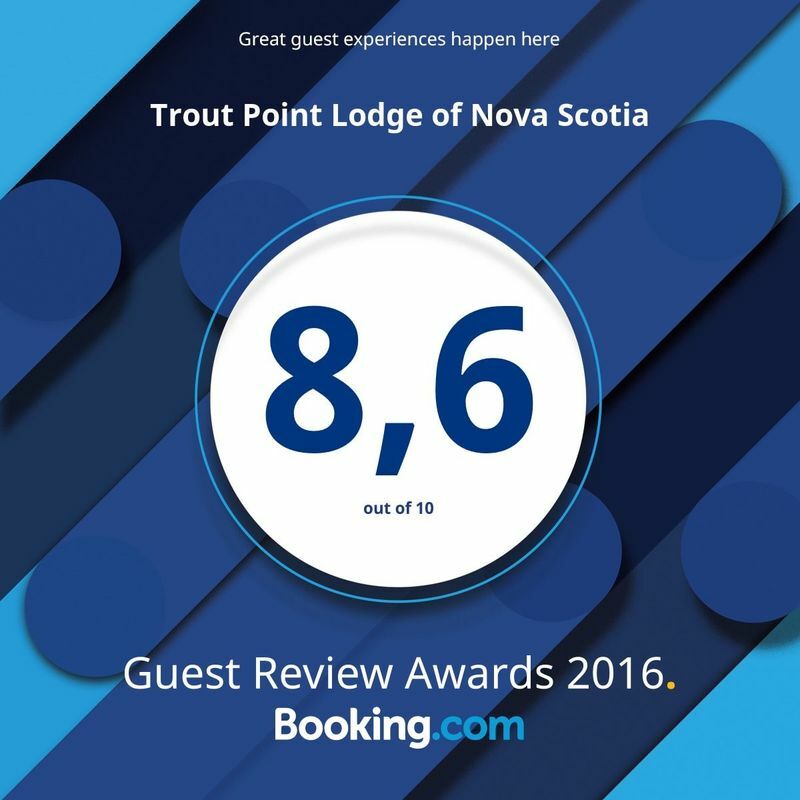 Trout Point Lodge is the sole accommodation selected as a Fodor's Choice for the 2012-13 and 2014-15 guides to Nova Scotia and Atlantic Canada, and one of just two for the 2017-18 guide. Fodor's Choice selections recognize the top sights, properties, and experiences that Fodor's professional travel writers have found while traveling the world. These places are the "best of the best," providing remarkable experiences in their price range, destination, or category. Best Travel Finds of 2014, Redbook magazine. "Got a travel bucket list? You're going to need a bigger bucket." The World’s Best Luxury Hotels and Resorts Worldwide Awards is an annual event since 2005. A team of luxury hotel experts selects finalists for the Awards from among more than 4400 luxury hotels worldwide. Properties winning the World's Best Top 50 Hotels Award “reflect the full array of exclusive options from the classic and iconic favorites to intimate and inviting inns to sprawling oceanfront resorts.” The 50 properties were selected using an algorithm based on the Alliance’s web site page views, bookings, feedback, and 3rd party sources. The Best Hotel Restaurants Award goes only to properties where “world-class restaurant is the proximity of fine-dining to luxury guestrooms,” according to the Alliance. “The World’s Best Hotel and Resort Restaurant means grand hotel dining within a luxury property. Michelin stars and top-starred Forbes Guide restaurants abound on our list of the top luxury hotel and resort restaurants.” The World’s Best Luxury Hotels and Resorts Worldwide Awards is an annual event since 2005. A team of luxury hotel experts selects finalists for the Awards from among more than 4400 luxury hotels worldwide. In his April, 2013, selection of 6 Maritime inns, renowned travel critic Andrew Harper recommended Trout Point Lodge in the Hideaway Report: "precisely what you would hope to discover deep in the woods:" "camp-style elegance," "all the touchstones of rustic refinement," and "the kitchen’s inventiveness." "Trout Point is the kind of place where you can take on the great outdoors — guided canoeing, hiking and more — or simply find the right spot and settle in for a nap masquerading as an attempt to read. (The sound of the Tusket is an ideal lullaby.)" The Lodge joined Select Registry: Distinguished Inns of North America in 2013, after a rigorous, anonymous inspection process. Trout Point Lodge is "Men's Journal Approved." In 2013, the magazine endorsed the Lodge as among the world's top 19 wilderness lodges: "the real charms of this cozy, 100-acre forest retreat are earthbound." The Lodge is listed among the world's top 10 eco lodges by away/.com: "where sustainability and eco-friendly approaches come as part of the package." BedandBreakfast.com chose Trout Point among the top 10 Canadian inns for 2012, the eighth annual web-based awards for Canada B&Bs and inns. The selection criteria for the Best of BedandBreakfast.com Awards included both a quantitative and qualitative analysis of traveler reviews from the past year and inn listings on BedandBreakfast.com. Trout Point Lodge appeared on the worldwide top 10 list of eco lodges published by USAToday Travel in April, 2012. The worldwide list of accommodations that “adhere to green values, offering nature adventures in a sustainable setting” was compiled by veteran travel journalist Larry Bleiberg and green vacation expert Irene Lane of greenloons.com. The article forms part of the popular national newspaper’s “10 great places” series. Trout Point Lodge is the hotel in Atlantic Canada chosen for review by London's Telegraph newspaper, home to highly critical professional reviews. The Lodge scored an impressive 8/10 overall, with 9/10 in the categories of food/drink and location. "This is a wilderness lodge with a difference, memorably designed and serving food not to fill your hiking boots but to tickle your palate." Trout Point Lodge was recommended among North America's Best Getaways by Zagat in 2011, the only such property in Atlantic Canada. The guide featured hotels and restaurants known for their attention to detail, superior hospitality and distinct personalities. In 2011, Departures--the sister magazine of Food & Wine and Travel & Leisure--selected Trout Point Lodge among the top 10 foodie getaways worldwide, as reported by the Halifax Chronicle-Herald. In mid 2009, the National Geographic Society announced that Trout Point was among 10 worldwide finalists in the Geotourism Challenge: Power of Place. The Lodge was the only accommodation among the finalists. A distinguished panel of judges - Nobel Peace Prize winner Dr. Wangari Maathai, founder of the Green Belt Movement; Keith Bellows, editor of National Geographic Traveler magazine; Erika Harms, executive director of Sustainable Development, United Nations Foundation; Tony Wheeler, founder of Lonely Planet; Ben Keene, founder of Tribewanted; and Dr. Yang Yuming, vice president of Southwest Forestry University, China - reviewed the entries and selected Trout Point Lodge for revitalizing backwoods area of Acadian Forest through place-based immersion experiences and the Nova Scotia Seafood Cooking School. In 2010, the Society's Center for Sustainable Destinations presented a Certificate of Excellence to the Lodge. Trout Point received recognition from its peers and awarded the inaugural Green Restaurant Award from the Restaurant Association of Nova Scotia in November, 2009.